Maybe it is really best for an artist to be poor, at least at the beginning of a promising career. It seems to me that inherited riches stopped the artistic career of a potentially great French painter, Gustave Caillebotte. Caillebotte, 1848-1894, was born to an upper-class Parisian family; most of their large fortune came from textiles used for military uniforms. I can almost hear the family arguments that resulted in Caillebotte going to law school. He was licensed as a lawyer in 1870 and was also trained as an engineer. (“Painting will never get you anywhere, son. Besides, why don’t you just run the family business? We need you.” This is all speculation on my part, of course). Anyway, Caillebotte was drafted to fight in the Franco-Prussian War for almost a year, 1870-1871. 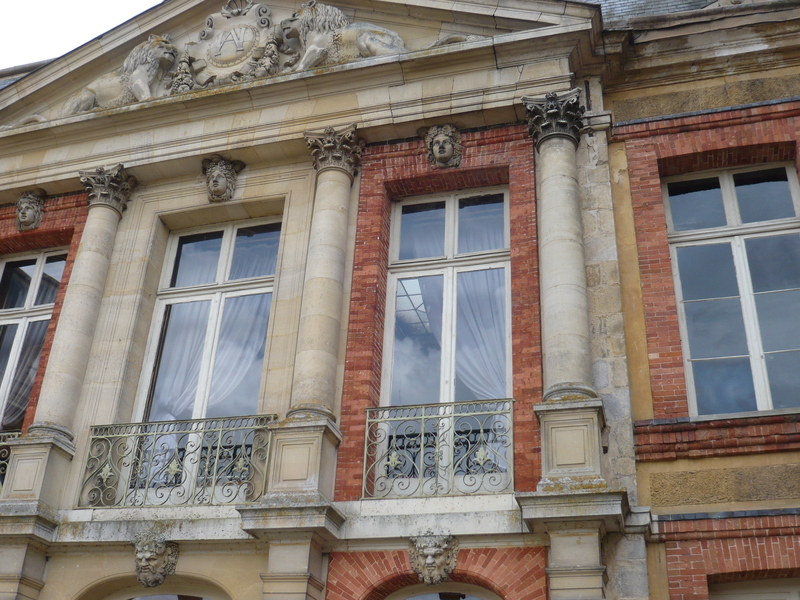 He returned home safely, but rather than working in the family business or practicing law, he began serious study of art at L’Ecole des Beaux-Arts. I’d speculate that after seeing the horrors of war, he was determined to spend the rest of his life doing exactly what he wanted to do. And being the heir to a very wealthy family gave him the means. 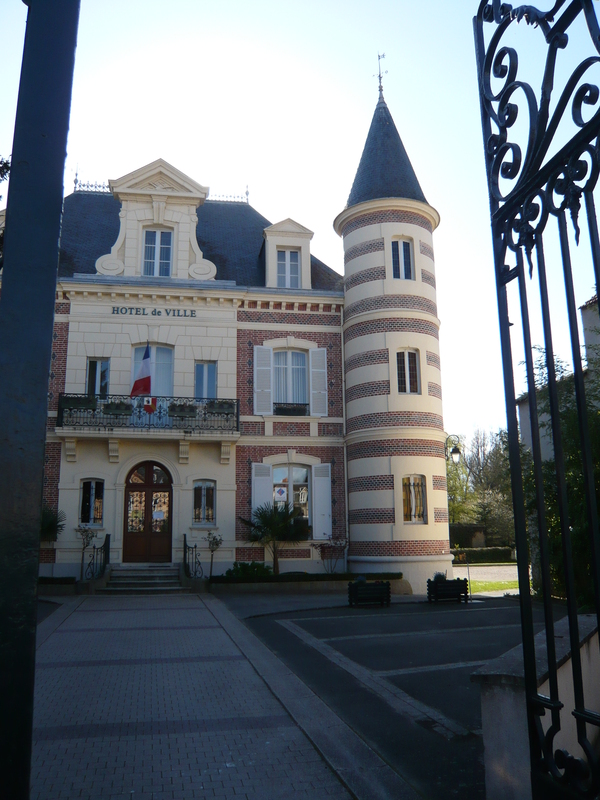 Last year while in Paris I made a trek by train about 12 miles south of the city to the country mansion of the Caillebotte family in the posh suburb of Yerres. There was a special exhibit of the artist’s work. 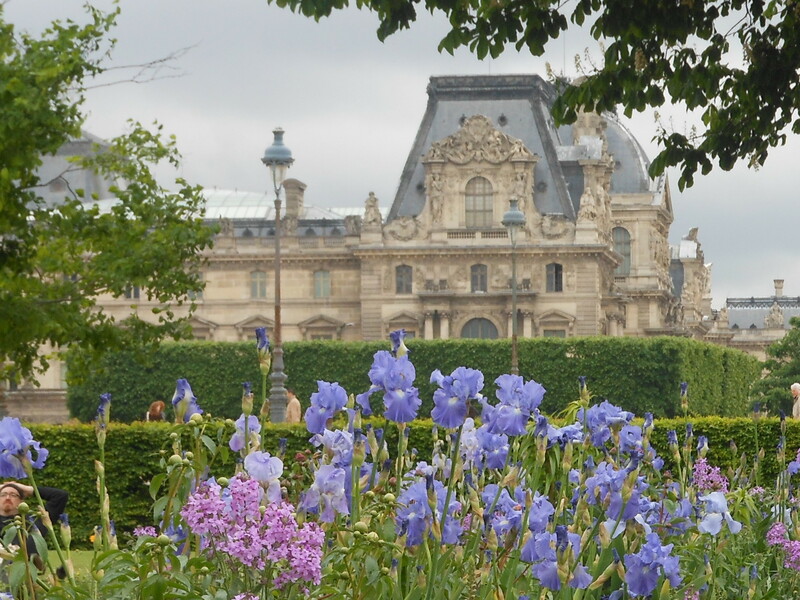 The champions of his work billed Yerres as “Caillebotte’s Giverny”–the tourist magnet that is the beautiful home and garden of Claude Monet. That was wishful thinking, at least for now. 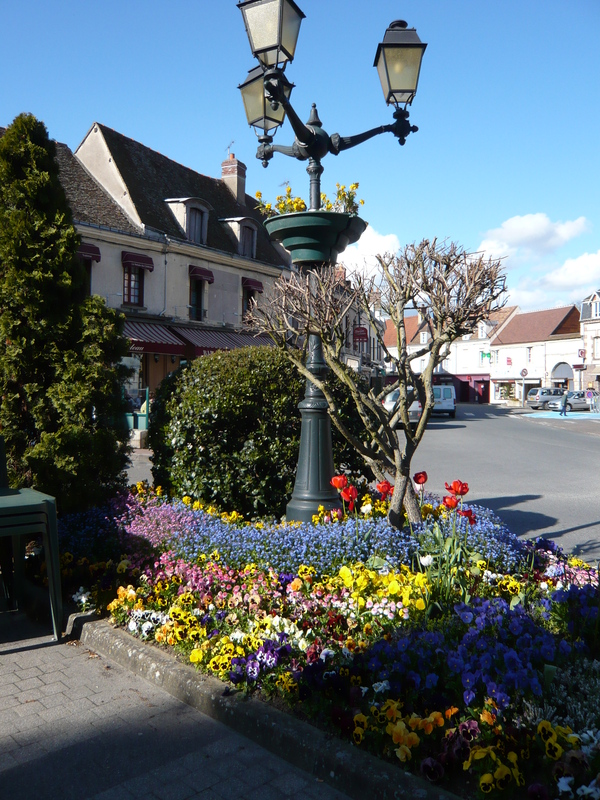 I doubt that Yerres will ever have the hordes of tourists that descent daily on Giverny. But that is not a bad thing. No photos were allowed inside the exhibit; that was just as well, because it was easy to give each wonderful painting the close attention it deserved. 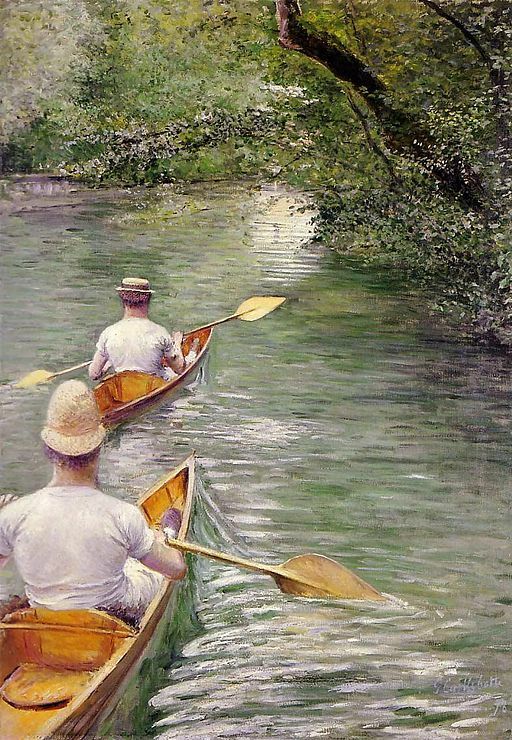 Caillebotte painted in a much more realistic style than many of his Impressionist friends, and often from unusual perspectives. The property was much larger when the family occupied it. 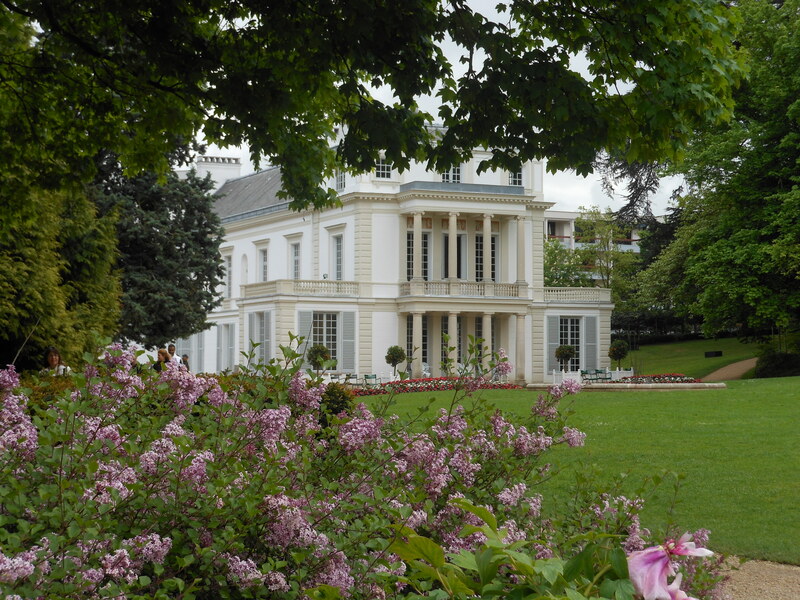 But the house and grounds are still beautiful, and beautifully placed on the banks of the River Yerre. I especially loved the virtuoso painting above, depicting a moment of time as rain falls on the still surface of the river. I loved the play of light and shadow. It was on loan from the Indiana University Art Museum in Bloomington. The exhibit had many other water scenes, like this one with its unusual vantage point just behind a pair of men paddling canoes on the river. 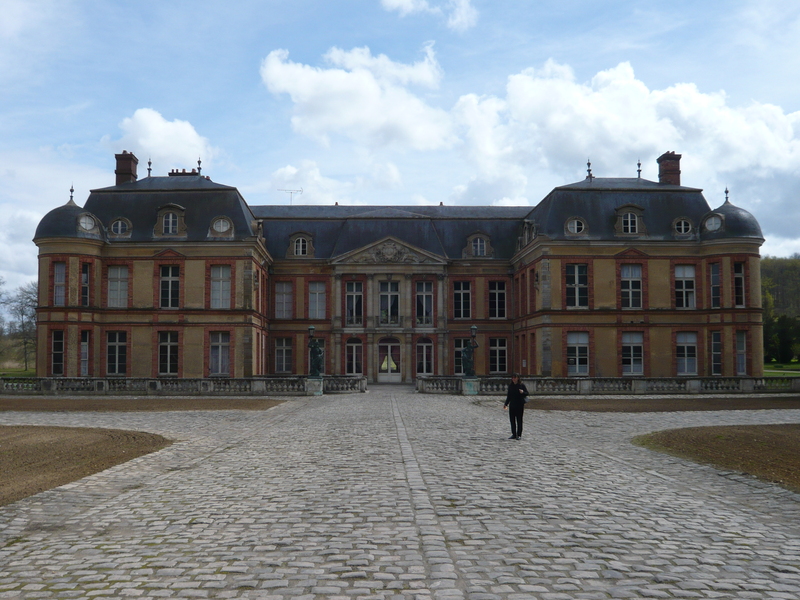 It was on loan from the Museum of Fine Arts in Rennes. I stood for a long time in front of this painting of a gentleman rowing in a top hat and bow tie, and bought a large postcard of it. If I could carve out the time, I would travel to Washington, D.C. just to see this one painting again. The image above is from the website article from the National Gallery exhibit, cited below. What if the moments of our lives could be captured in a few thoughtful paintings, rather than a never-ending stream of selfies and forgotten party snapshots? From his family’s Paris city home, Caillebotte also found unusual perspectives. 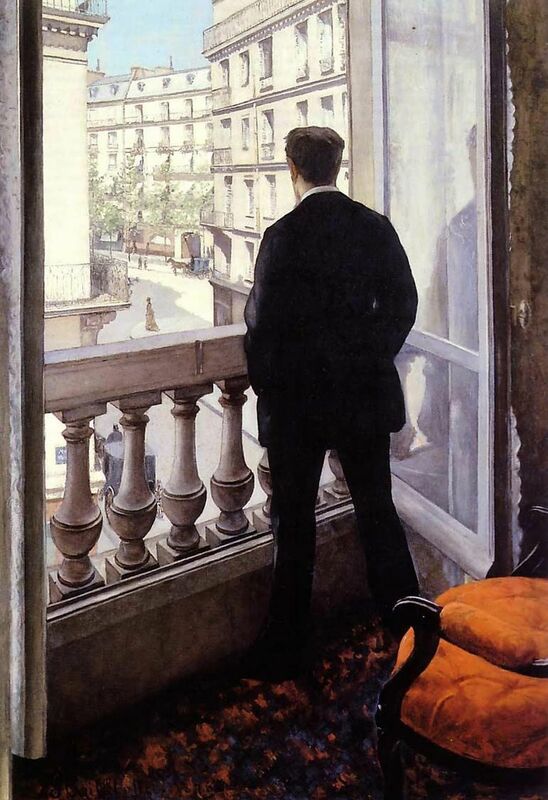 The painting above shows Caillebotte’s younger brother looking out over the street from the Paris family home. The painting is from a private collection. Caillebotte’s most famous painting, The Floor Scrapers, was controversial in his day. This masterpiece was actually rejected by the Salon of 1875. But the Impressionists loved it, and it appeared in their second Impressionist exhibit, where people stood in front of it and argued. Why? There was already a time-honored tradition of painting peasants at work in the countryside, but almost no one had honored urban laborers by painting them. 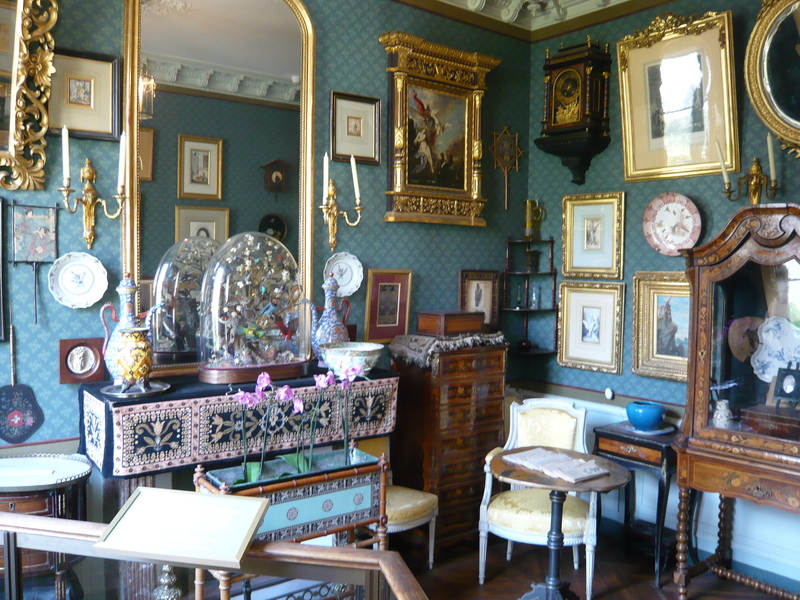 The scene is believed to show a moment of refurbishment of the artist’s own studio in Paris. I love the play of soft light from the open window, the delicate curls of the planed wood, and the sweating shirtless laborers. 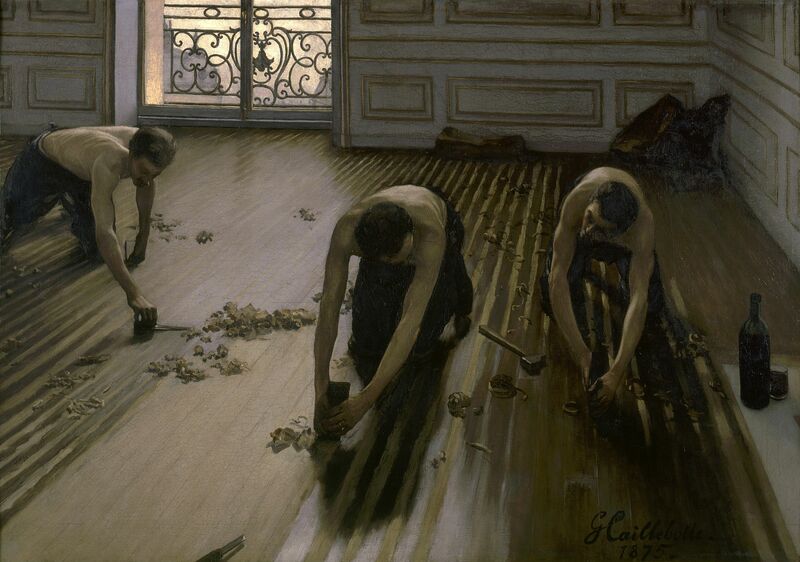 Did Caillebotte gain an appreciation of the work of ordinary people during his wartime service? 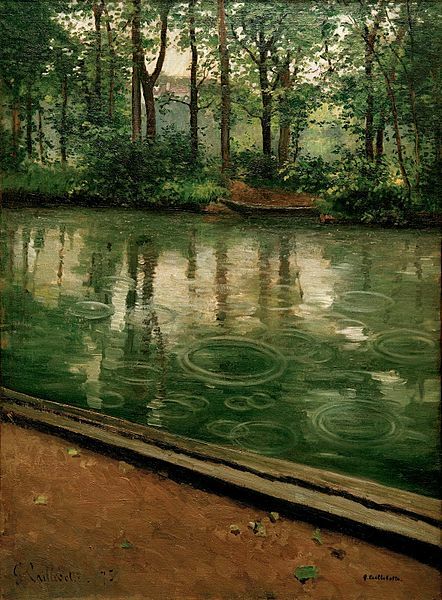 Sadly, Caillebotte mostly stopped painting at age 34; he was more interested in photography. The exhibit I saw had a number of his photos, but in my mind they paled beside his paintings. I wish he had stayed with his brushes and canvases. 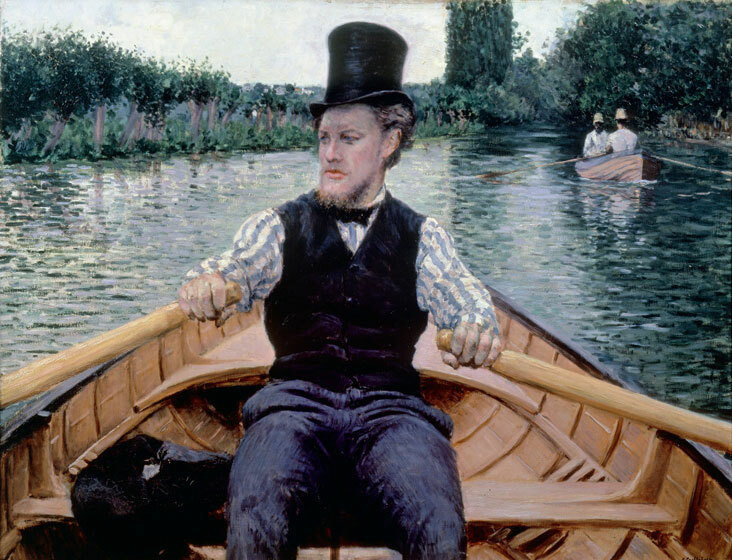 For many years, Caillebotte was neglected as an artist and more well known as a patron of other artists, notably his Impressionist friends Auguste Renoir, Claude Monet and Camille Pisarro. He bought their canvases, funded and curated their exhibits, and sometimes paid their rent. Did Caillebotte believe he had reached the limit of his abilities and it was better to be a patron of more talented artists? Or was painting just too much hard work? He had the means to do anything he wanted to do. What he wanted was to hobnob with artists, grow orchids, build yachts, collect stamps, and generally enjoy himself. Who can blame him? And yet I wish he’d had a bit more of a work ethic. Caillebotte died while gardening in 1894, aged only 45. 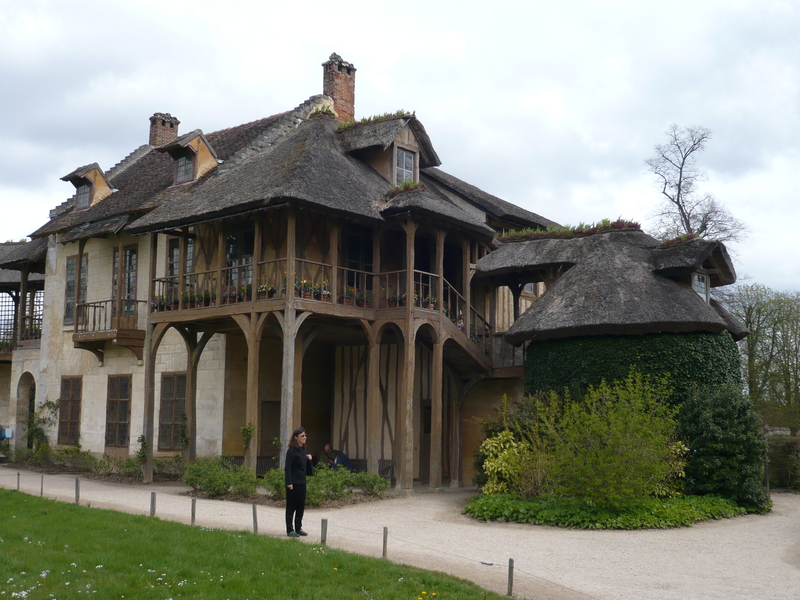 He owned a collection of over 70 mostly Impressionist paintings, which he bequeathed to the French state on his death. They formed the core of the state’s Impressionist collection. 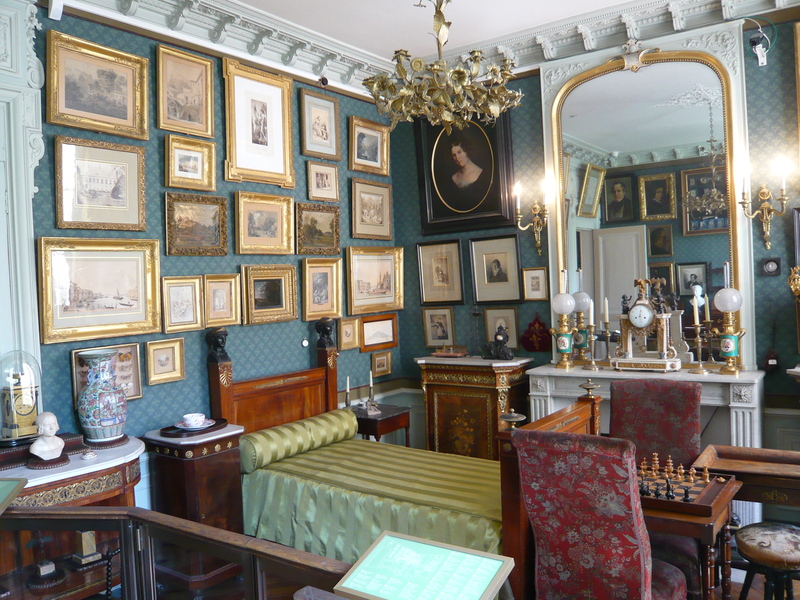 Modestly, he only included two of his own paintings in the bequest. The rest remained mostly with his family, since he had no need for money and rarely sold a painting. 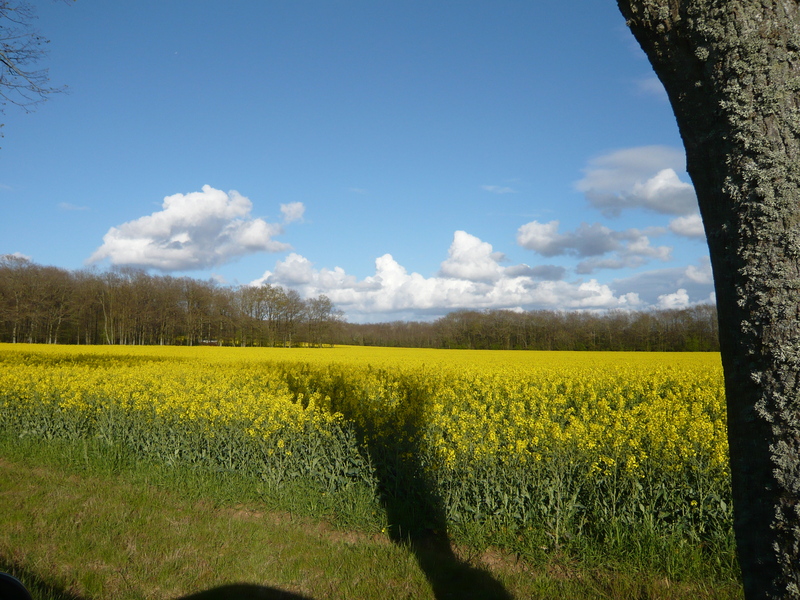 This entry was posted in Art, Artists, France, Paris, Paris Museums, Why I Love France and tagged Auguste Renoir, Camille Pisarro, Claude Monet, Gustave Caillebotte, National Gallery, Yerres on July 25, 2015 by Claudia Suzan Carley. 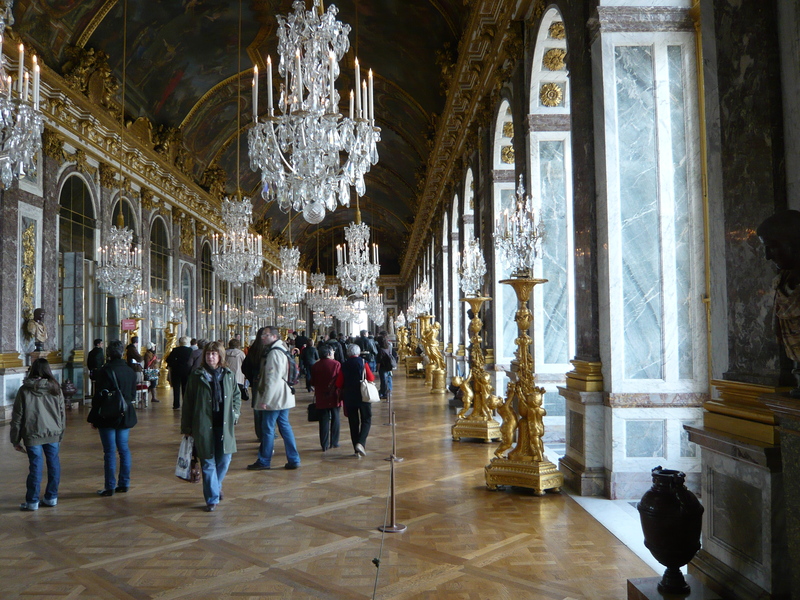 What’s a Queen to do when the gilded glories of Versailles get to be a bit much? 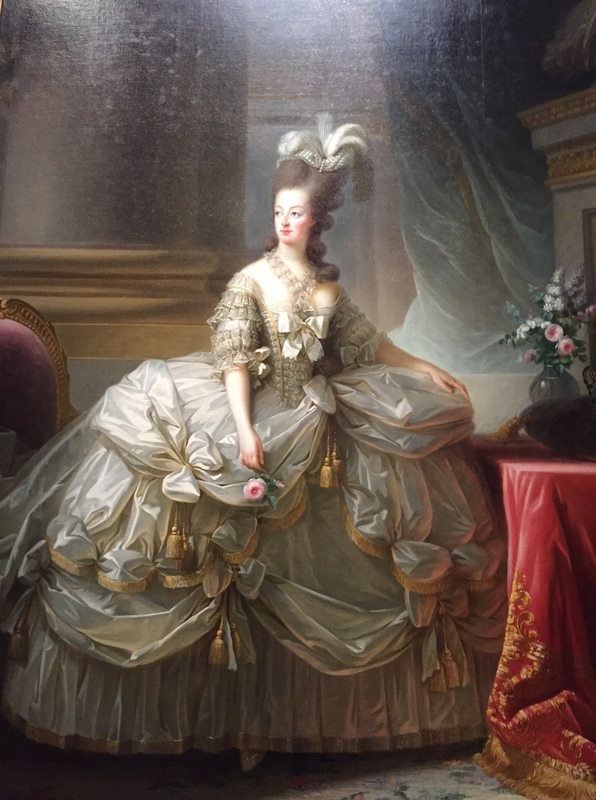 Early in her reign, Marie Antoinette larked around Paris, shopping and taking in theatre and opera performances. 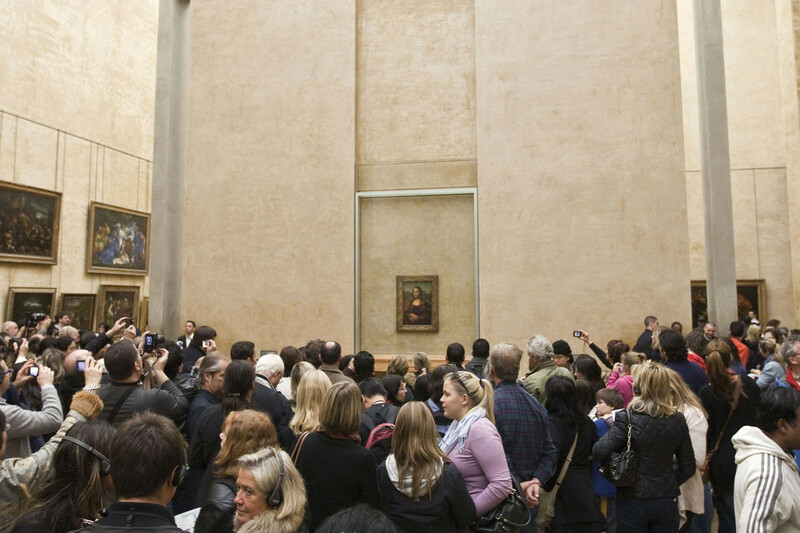 Adoring crowds applauded her beauty and grace. That was then. Things changed, for the worse. Retail therapy became a lot less therapeutic. The Paris crowds began to turn restive, then hostile, and finally lethal. 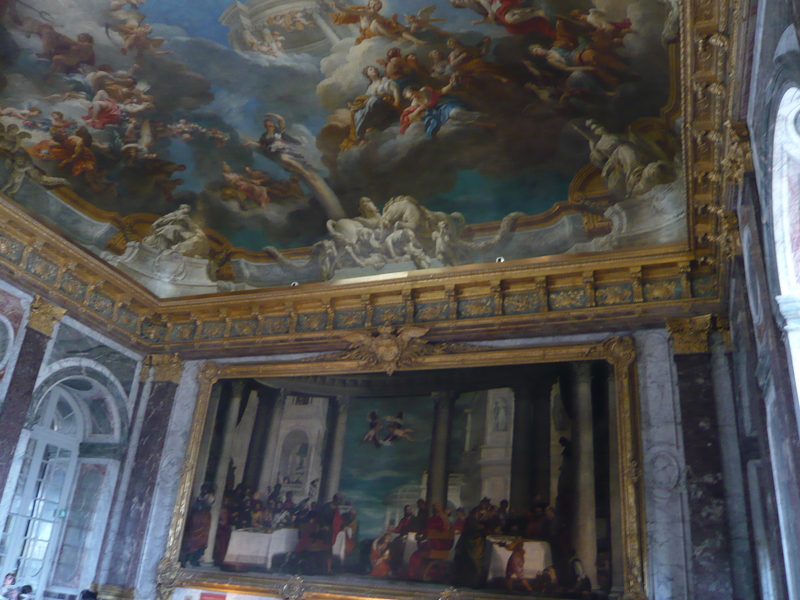 The Palace of Versailles was the permanent and mandatory home of at least 3,000 people, courtiers and their servants. 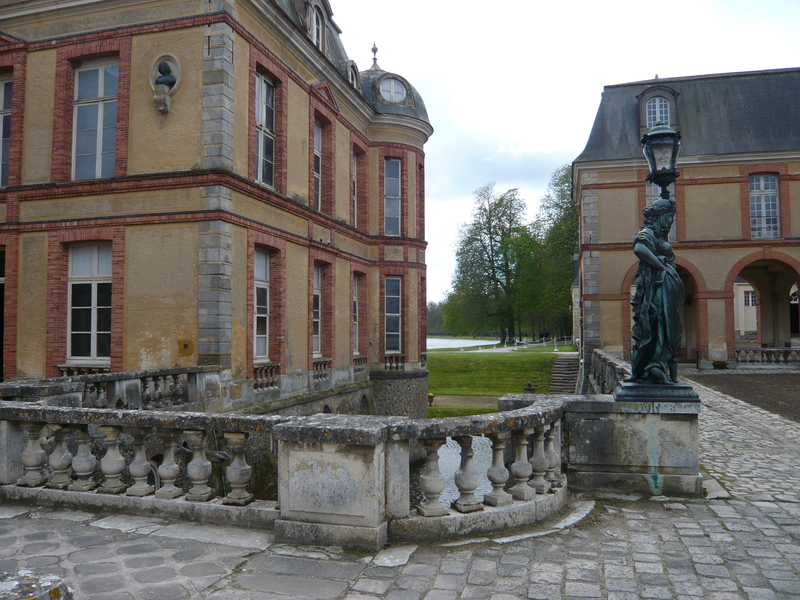 The Grand Trianon and the Petit Trianon are elegant, smaller, private palaces conveniently close to the ever-crowded main palace. They’re great for private dinners away from the majority of prying eyes. But still, a girl sometimes needs to just get away from the whole kit and kaboodle. 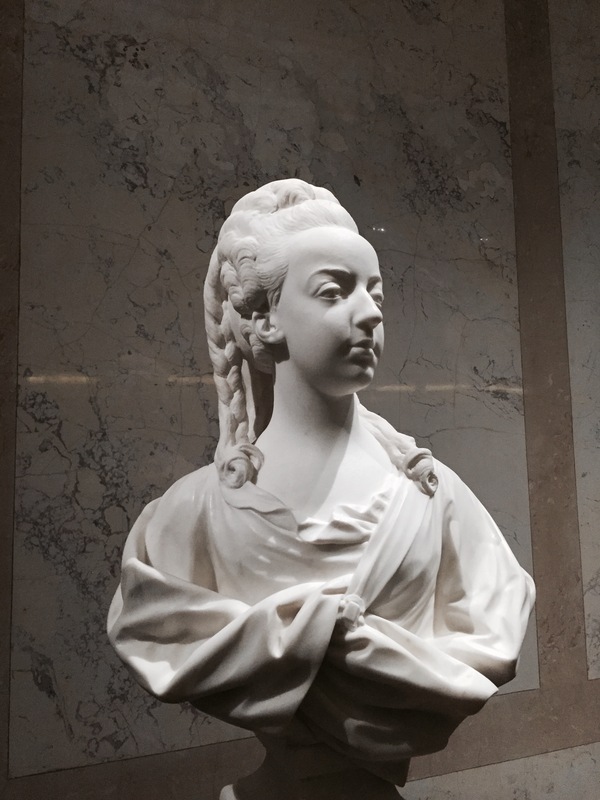 Marie Antoinette’s haughty pose was set in stone, as far as the angry intellectuals and hungry mobs plotting revolution. (After all, she had been raised to carry herself like a queen). But she had fond memories of running wild as a child in the wooded grounds of Schonnbrunn Palace, with her many brothers and sisters. She had an idea: she ordered up her own personal getaway within the vast grounds of the Palace. 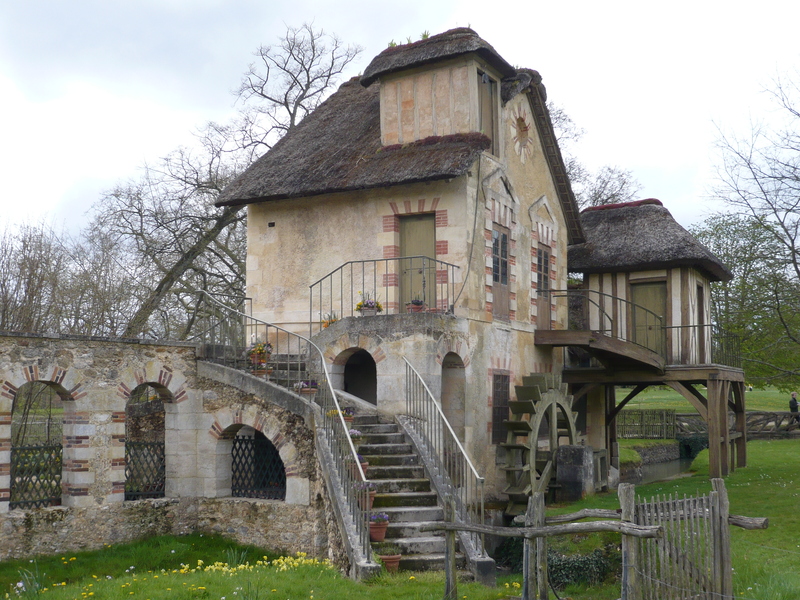 Le Hameau de la Reine, The Hamlet of the Queen, was built for Marie Antoinette in 1783. It was a large fenced-off area, open only to the Queen, her children, and her dearest friends. 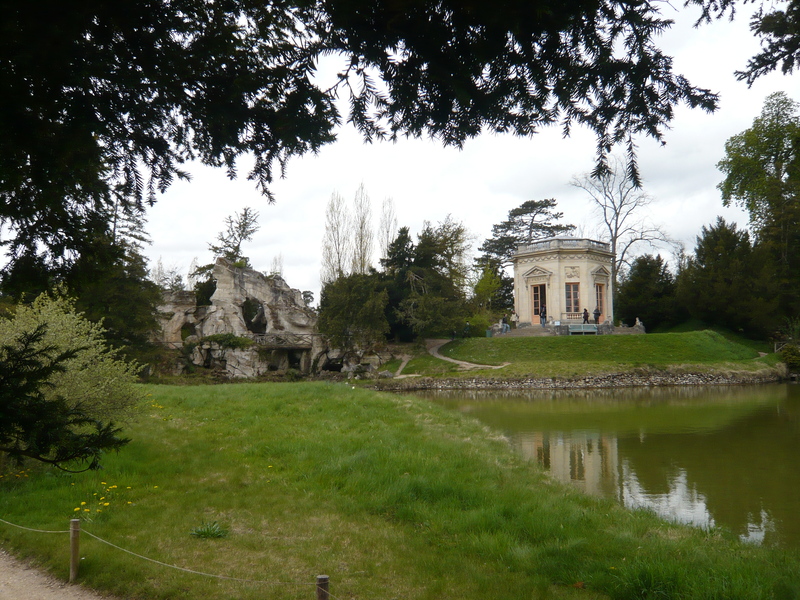 It included private gardens much more informal than the main grounds. There were pretty, grassy walks and a Temple of Love on an island. 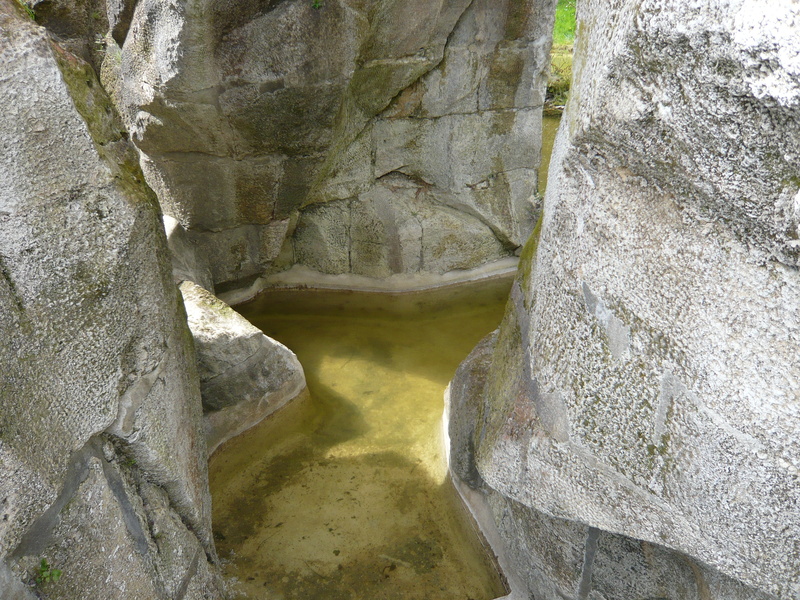 There was a grotto–a sort of custom-made concrete movie set meant to look like a cave. The grotto was perfect for games of hide-and-seek with the many lovers the queen was rumored to entertain. Were the rumors true? In the end, it didn’t matter one way or the other. But the most notorious feature of the Hamlet was the Queen’s Farm. Quaint rustic buildings created a fairy-tale version of a working farm. The Queen spent carefree days dressed in simple white muslin and a straw hat. She milked carefully groomed cows using specially made Sevres china buckets. There was a special billiards room attached to the main house–naturally, an important room in any farmhouse. There was an actual working farm nearby which provided shampooed and scented cows, sheep, chicken and ducks. I’m sure her kids loved it. 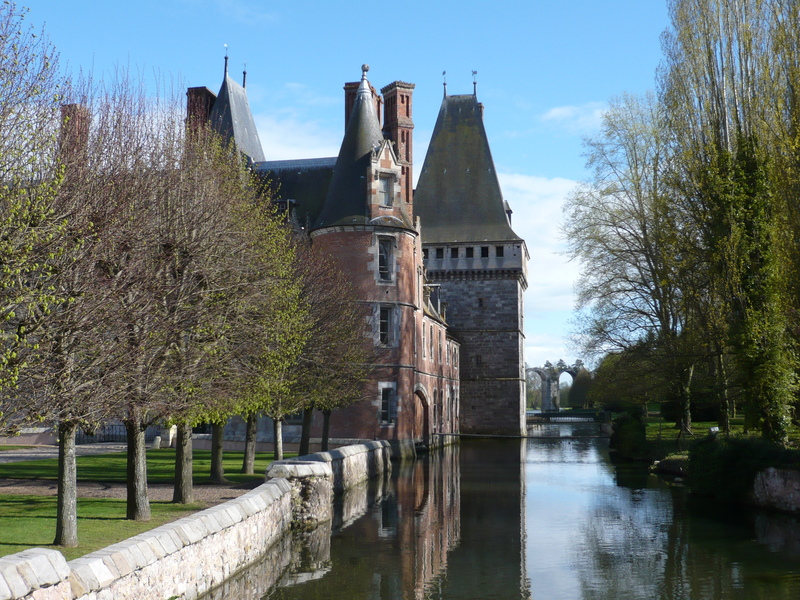 Today, the Hamlet is a place to ponder the wretched excesses that led to the French Revolution. When angry mobs arrived at the gates of Versailles, they had no sympathy at all for a Queen who played at being a peasant. For Marie Antoinette, there was no escape from her destiny. 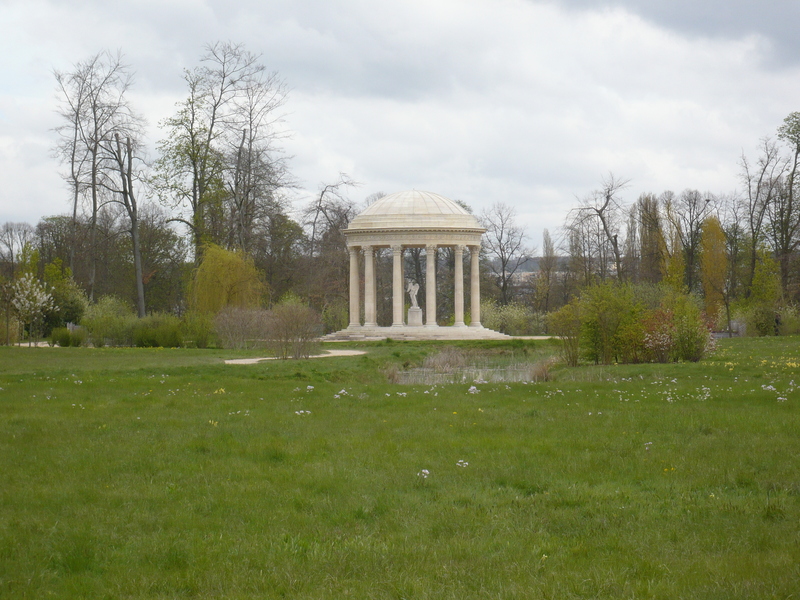 This entry was posted in France, Paris, Paris Museums, Paris Sights and tagged French Revolution, Le Hameau de la Reine, Marie Antoinette, Marie Antoinette's farm, Palace of Versailles, The Hamlet of the Queen on April 16, 2015 by Claudia Suzan Carley.